Modern hospitals are equipped with the latest technologies and treatments. Whether it's treating complex conditions like heart disease to simple fractures, doctors and nurses have never been in a more advanced position. It's fair to say that technologies such as medical imaging and x-ray scanning have revolutionised the healthcare world, but there's still more to come. Wearables, in particular, are garnering massive interest from health professionals, researchers and institutions. From VR headsets being used to train the next generation of doctors to in-body sensors that can track patient vitals, the hospital of the future will be connected, real time and powerful. In hospitals, it's crucial that doctors monitor patient vitals to detect any irregularities, but previous technology has been clunky and full of wires. California-based start-up VitalConnect is working to change this with a compact wearable device. The company has developed a lightweight, disposable patch that's attached to a patient's chest and provides information about their heart rate, breathing, skin temperature, body posture and ECG stats via a special app. Named Vital Patch, it's been designed specifically for caregivers. It sends them real-time data so they can track the health of patients and enable rapid response care if any symptoms change. Inside the device, there are ECG electrodes to detect heart rate, a 3-axis accelerometer to detect motion and a 96-hour battery. The patch has already been approved by the Food and Drug Administration in the US. "With the ability to stream the data from the biosensor continuously and in real-time, care-givers can monitor an entire floor of patients more efficiently and attend to patients that need the most attention at the most critical time," says Nersi Nazari, VitalConnect's CEO. "The VitalPatch biosensor enables better healthcare for patients, at a lower cost for hospitals than has not been possible until now." Getting into an MRI scanner is an uncomfortable experience for anyone, but for children, it can be extremely frightening. However, an MRI physicist at King's College Hospital in London is on a mission to change this. He's developed a first-of-the-kind application to help children get used to MRI scanners. The app, called My MRI at King's, uses panoramic 360 degree videos to give children a glimpse into what an MRI scan looks like before the real thing takes place. Accessing the app on a virtual reality headset or a mobile device, the child is taken through all the events that will happen on the day, from arriving at the hospital to getting into the scanner. Jonathan Ashmore developed the app in collaboration with a specialist team at the hospital to ensure they can use the resource with children before the scan happens. "I was given a 360 degree camera as a present, and I wanted to use it to help anxious children I see come into the hospital. As an MRI Physicist, putting the camera inside the scanner seemed like the most logical place to start," he says. London-based Medical Realities is also looking to transform the health world with wearable technology. Working with the likes of the NHS and Association of Surgeons in Training, the company creates VR, AR and gaming experiences to cut the cost of training and provide a safe learning environment for medical students. The Virtual Surgeon is the firm's flagship training programme. 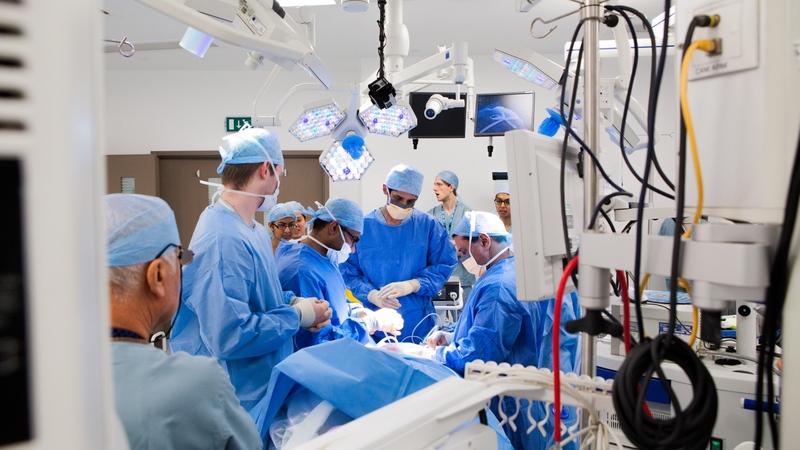 Designed for head-mounted displays such as the Oculus Rift and Samsung Gear VR, it lets students experience the inside of an operating theatre through the eyes of a consultant surgeon. Steve Dann, co-founder and CEO of the company, says he set up his company to help close the skills gap in the medical world. "Medical Realities is using new technologies such as virtual reality and augmented reality to address the worldwide lack of surgically trained practitioners," he says. "VR technology is allowing us to deliver first class surgical training to anybody, anywhere in the world. From our ever growing library of VR operations, students, doctors, and surgeons will have the ability to view and learn, directly from the perspective of the teaching surgeon." Oxehealth, which is based in Oxford, is another exciting startup creating pioneering technology for hospitals. It has designed a system that allows doctors and other healthcare professionals to track patient vitals - including heart rate and breathing rate - through low-cost digital camera sensors. The company's software enables cameras to detect the location of patients and extract information about their health. That may sound like something out of a sci-fi movie, but a concoction of computer vision, signal processing and machine learning technologies makes this possible. This system can work with any video camera sporting a capable chipset, making Oxehealth a software-only company. It's the first joint spin-out from University of Oxford and Oxford University Hospitals Trust. The firm has also completed successful trials at Broadmoor Psychiatric Hospital and with a leading UK police force. Speaking to Wareable, CEO Hugh Lloyd-Jukes says: "Oxehealth is the first company in the world to deliver continuous, medical-grade contact-free vital signs and human activity monitoring through standard digital video camera sensors. We can accurately monitor the vital signs and activities of patients or detainees from across the room, completely contact-free." American computing giant IBM is also betting on the lucrative medical wearable market. In February, researchers at the firm unveiled a gadget that they described as a "cognitive hypervisor". Essentially, it's a hub that can take information from wearable devices located throughout a hospital. Wearables vs killer diseases: Is tech winning? This information is sent into the IBM Cloud, where it's analysed and sent back to both patients and doctors. Patients wear a wearable device when they're going about their daily lives, and doctors can then get a better idea of their health when they're back in the hospital. While this is only a prototype product, it gives a glimpse into what the hospital of the future might look like. In a blog posted on the company website, advanced micro integration researcher Bruno Michael writes: "Our goal is a health companion and we call it the cognitive hypervisor. We want to enable patients to leave the hospital sooner, so they can recover from the comfort of their own home, while still receiving care remotely from trained medical staff."